Use Budget Memorial Day Decorations to Save on Holidays! Home Deals Use Budget Memorial Day Decorations This Year to Save Money on Your Holiday Party! Use Budget Memorial Day Decorations This Year to Save Money on Your Holiday Party! Memorial Day 2016 is just one week away. Do you have special plans for Memorial Day weekend? Maybe you have a fun picnic planned or a backyard cookout with all your family and friends. What would a Memorial Day celebration be without Memorial Day decorations? There are simple and inexpensive ways to decorate for any Memorial Day celebration. Plus, if you use patriotic decorations for your Memorial Day weekend festivities, you can reuse them for 4th of July decorations! 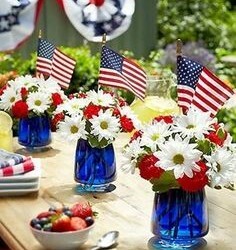 Check out our recommendations below for DIY party decorations for Memorial Day. An extremely simple table decoration which could also serve as DIY home decor consists of white daisies (or other simple flowers) in three glass jars. Just add a few drops of red food coloring to the water in one jar, blue food coloring to the water in another jar, and no food coloring in the final jar. The result? Red, white, and blue decor! Get 3 mason jars or clean, clear glass jars. Spray paint all three jars white with spray paint and allow them to dry. Use masking tape to create thick stripes on two of the white jars. Then, paint the white areas red and allow the paint to try. After the paint has dried, peel off the tape to reveal alternating red and white stripes. On the final jar, stick cut out stars all over the jar (you can use tape to create the star shapes). Paint over the white paint with blue paint and allow the jar to dry. Peel off the tape stars to reveal white stars behind the blue background. This makes a cute and simple room decor DIY. Let your kids create their own DIY party decorations for your Memorial Day celebration. Take a large, empty egg carton and flip it over so that the egg slots are facing down. Have your child paint the bottoms of the 4 egg holders in the upper left corner of the carton blue. Your child can paint the rest of the carton bottom red (i.e. the space between each egg slot) except for the very bottoms of the egg holders. Those should be painted white. Add 4 white stars to the blue egg slots in the upper left corner.